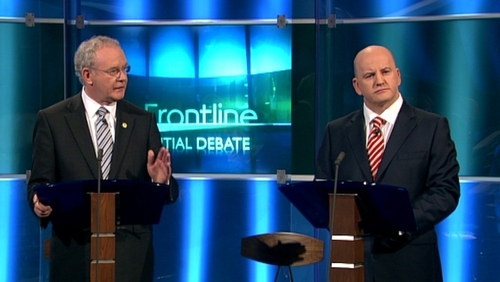 The Broadcasting Authority of Ireland has upheld a complaint made by former Presidential candidate Seán Gallagher relating to the Frontline Presidential Debate Broadcast on RTE Óne television on 24 October, and the Today with Pat Kenny radio programme broadcast the following day. Mr Gallagher argued that the broadcast of a tweet from what had been erroneously described as the 'Martin McGuinness for President Campaign' was unfair, and "indicative of a lack of objectivity and of partiality towards the candidate". He argued that this programme coupled with a subsequent interview during the Today with Pat Kenny programme were in breach of the section of the Broadcasting Act dealing with fairness, objectivity and impartiality. The Compliance Committee of the BAI decided to uphold the complaint. It said the broadcast of a tweet incorrectly attributed to the official Martin McGuinness for President Twitter account was unfair to the complainant. In its decision, it said that verification of information is an important role for broadcasters, particularly in the context of news and current affairs and coverage of national ballots. The BAI also said there were no apparent efforts made by RTÉ to verify the source and accuracy of the content of the tweet. The committee also noted that information was available during the course of the programme that clarified that the tweet account was not an official Sinn Féin account. It was the committee's view that the failure to provide clarification on the provenance of the tweet was unfair to the complainant. Regarding the Today with Pat Kenny broadcast, it was the committee's view that those parts of the programme dealing with Mr Gallagher exacerbated the unfairness evident in the Frontline debate, insofar as it did not include any clarification by the presenter regarding the provenance of the initial tweet. However, the BAI also said there was no evidence that the broadcaster, presenter or production team deliberately concealed information relating to the initial or second tweet or constructed the programme in a way that lacked objectivity or impartiality. It was also the committee's view that there was no evidence to question the bona fides of the programme presenter or the production team. The committee was of the view that the complaint was not of such a serious nature to warrant an investigation or public hearings as requested by the complainant. In a statement, Seán Gallagher said: "I welcome the decision by the BAI. It confirms my view that there was an institutional failure by RTÉ. "This public service broadcaster introduced, in a grossly unfair manner, a controversial and bogus tweet into a crucial and live Presidential Election debate, just days before polling, without first having verified where it came from, and whether it was in fact genuine." Speaking on RTÉ’s Six-One News, RTE Director General Noel Curran said he had no hesitation in apologising to Mr Gallagher. Mr Curran said he accepted the ruling by the BAI. He said RTÉ expects and attains the highest standards, but on this occasion mistakes were made and it was important to acknowledge those mistakes and to learn from them. In a statement, Mr Curran said RTÉ should have verified the tweet. RTÉ Chairman Tom Savage has said the RTÉ board will discuss the ruling at a meeting on Friday.